Everyone is well-aware of Fort Lauderdale's place a top hub for international cruises with dozens of ships departing Port Canaveral daily. However, in addition to those longer destination adventures, time-strapped visitors and residents of the city can still find great experiences out on the water. These top five day cruises offer patrons a unique look at Fort Lauderdale and the surrounding area. They're a great, affordable way to check out the city's fantastic waterways and still make it back on land for dinner! The Jungle Queen is perhaps Fort Lauderdale's best-known day cruise. Since 1935, they have served over 18 million guests and are considered the longest continuously-running variety show in the United States. 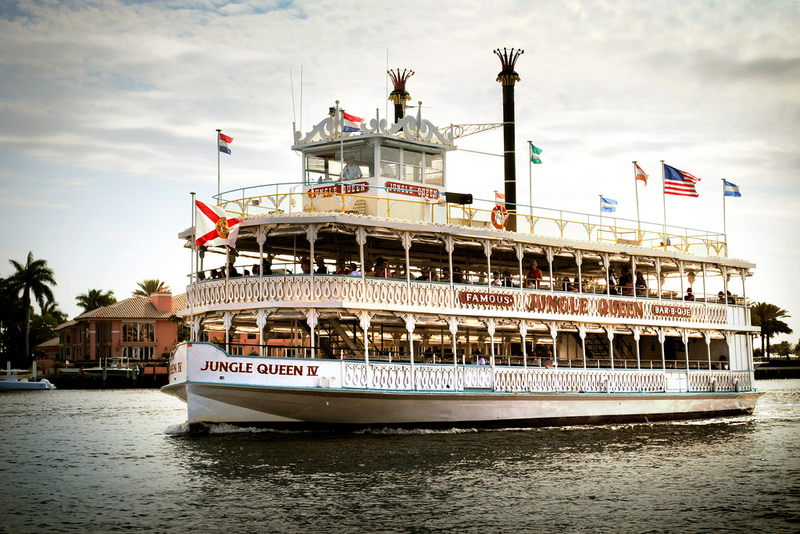 The Jungle Queen offers 90-minute cruises at 11:00 a.m., 4:30 p.m. and 7:00 p.m that take you down the New River and through Millionaire's Row. They also have a four-hour afternoon cruise that departs at 1:30 p.m. and takes passengers to a tropical isle where they can see exotic animals like alligators, lemurs and monkeys. The World Famous Dinner, Show, and Sightseeing Cruise is the most notable Jungle Queen ship. It departs for four hours at 6:00 p.m. and runs on different days in and out of season. Jungle Queen trips range in price from $24.91 for adults for the 90-minute cruises to $54.95 for the dinner cruise. The Carrie B. is a classic-style riverboat that takes you down the New River and the Intracoastal Waterway. Sightseers can see some of the most expensive real estate in South Florida and get a look at yachts from all around the world in Port Canaveral. The captain on board provides light narration explaining some of the most important landmarks seen along the journey. Full bar service and light snacks are also available. The Carrie B. departs at 11:00 a.m., 1:00 p.m. and 3:00 p.m, and tickets are $23.95 each. This cruise leaves three times daily from Downtown Fort Lauderdale. Passengers can choose to view the sights from a canopied observation deck or climate-controlled cabin. The one and a half-hour narrated cruise provides information about Fort Lauderdale's marinas and piers. Riders also get to see luxurious mansions and yachts along the city's Millionaire's Row that stretches from Tarpon Bend to the Intracoastal Waterway. Riverfront Cruises leaves the dock at 11:00 a.m., 1:00 p.m., 3:00 p.m. and 5:00 p.m. each day, and tickets are $25.44 each. Parents looking to have a unique experience with their kids need to check out Bluefoot Pirate Adventures. The Bluefoot is decked out in pirate ship stylings and sails the Intracoastal Waterway from the Bahia Mar Resort and Yachting Center for one hour, giving willing adventurers a great look at Fort Lauderdale. There are lessons handed out in pirate talk, on-board face painting, and water cannons to keep the kids entertained along the journey. Every child who rides gets a pirate certificate and bag of loot to take with them! The ship sails at 10:00 a.m., 12:00 p.m., 2:00 p.m., 4:00 p.m., and 6:00 p.m. March through October, and those first four time slots also run from November through February. Tickets are $25 per person and $6.50 for sailors under the age of two. The yellow and green Water Taxi is as iconic a part of the Intracoastal as the waterway itself. Riders can hop on and off the boat at any of its 15 stops to enjoy some of Fort Lauderdale's top restaurants, bars, and shops. The River Route takes passengers down the New River, the Fort Lauderdale Route sails down the Intracoastal, and the Margaritaville Express goes through Port Everglades to stop at the 5 o'Clock Somewhere Bar and Grill at the Margaritaville Resort. Select boats offer special two-for-one happy hour prices on drinks after 5:00 p.m. Boats arrive every 25 to 35 minutes at each stop on the first two routes and every hour on the hour at the Margaritaville Resort. Adult day passes are $28, and happy hour tickets are $18. If you want to get away but don't have the time or money for a week-long or more cruise, check out one of these top five day cruses from Fort Lauderdale to see amazing sights and enjoy some much-needed R&R! For more travel in Fort Lauderdale, register on 954area and connect to everything the city has to offer.